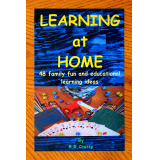 Learning at home by Rhonda Cratty is a new parent resource, filled with ideas to help children become the best they can be. Daily activities for family fun, that make subjects become more than pencil and paper, moving learning into everyday life. Learning at home gives parents an idea a week to challenge and motivate children. 48, four per month, educational learning ideas that can happen anytime. Around the kitchen table, in the backyard, on vacation, everyday within the comfort of family, using objects found around the home and books from any library. Filled with tips for family fun nights, holidays, trips and every day ideas to raise lifelong learners. Each idea can work with multiple ages and needs within a family. Tucked in are lists of family friendly books, recipes, homework help and games to extend learning.